Lorenzo Franco, in art “Larry”, starts to study piano at 6 years old. 1990 He started his Crooner’s carrier in the Jazz Sudio Orchestra from Bari. 1992 – 1993 Performed in Bruxelles for the “Delegation Permanente de l ‘Italie au Conseil Atlantique”. 1994 – 1995 Moved to Los Angeles for one year and studied vocal technique with Gene Merlino. In L.A. performed in several Jazz Clubs of West Coast. Performed by the Italian Institute Of Culture of Los Angeles where he met the movie director Michelangelo Antonioni and Sofia Loren in the occasion of the Oscar Nomination of Michelangelo Antonioni carrier on march 1995. 1997 Performed as crooner of the Italian Big Band of Marco Renzi at the National Radio Network “Stasera a Via Asiago”conducted by Adriano Mazzoletti (Rai Stereo Due). 1998 He met Nicola Arigliano the well know Italian crooner, and played piano in his trio till August of the same year. 1999 He toured with the Italian Big Band in the Arab Emirates, performing by the National Theatre of Abu Dhabi and by the Crown Plaza Hotel in Dubai. On May he recorded “Nuttin’ But Nat” dedicated to Nat King Cole, with Franco Cerri, Fabrizio Bosso, Massimo Manzi, Guido Di Leone. The Cd was introduced in the Europe scene by Giuliano Fournier on RADIO SVIZZERA “RETE 1”. 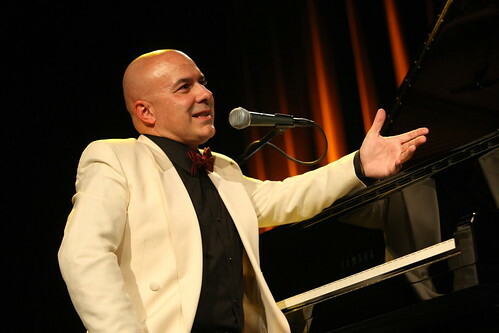 The same year he also recorded another CD called “Dixinitaly” with his traditional Jazz Band. 2000 He toured the Turkey, performing at Izmir and Ankara. On June he performer by the Middlebury College in Vermont (U.S.A). During the summer partecipated at Verona Jazz Festival sharing the same stage togheter with Natalie Cole and Herbie Hancock. 2001 He toured Etiopia, Addis Ababa for the Italian Institute of Culture. 2002 On March he came back to Turkey for the 9° edizion of Izmir European Jazz Festival, performing also by Ankara University and Istanbul by the Italian Institute of Culture’s Theatre and recorded two more Cds: “Christmas Songs” and “Dixinitaly 2”. 2003 On february he performed in India, at Kala Ghoda Art Festival in Mumbai and in New Delhi by the Kamani Auditorium. In June he performer in Greece to Patras, Athens (Megaro Mousikis Theatre) e Salonicco (at Mylos). During the summer he partecipated at Rimini, Terni and Livorno Jazz Festival. On the 2nd of July he came back to Middlebury College in Vermont to have a concert by the University Music Hall. On december 2003 he recorded in New York with Dado Moroni (p), Ira Coleman (cb) e Jimmy Cobb (dr). his Cd “Introducing Larry Franco, Jazz Singer!” by Philology J.R. W718). On december performed by the Camerata Musicale Barese in the Classical Season. 2004 On march he partecipated at Camerino International Jazz Competition. On Aprile 2004 the Nat King Cole tour with Franco Cerri, Dado Moroni and Ira Coleman. On May he toured in Marocco perfoming in Rabat at Mohamed V Theatre and by the Royal Golf Club for a Gala Dinner. On June he performer at Terni Jazz Festival with Daniele Scannapieco, and during the summer performing for several Jazz Festival in Italy and took part in a Tv Show of the Italian National Tv Rai Uno called “Linea Blu”. On November 11-15 he toured in Romania performing with his quartet in Bucharest for the Italian Institute of Culture and he took part in a Rumanian TV Show “TVR. From 20 to 23 november he performer by the “Quadriàme Art” in Tunisi for the Italian Institute of Culture. On december he toured Italy with Gary Smulyan, Ira Coleman, Bepi D’Amato, Michele Carrabba ed Enzo Lanzo for a tribute to Gerry Mulligan. 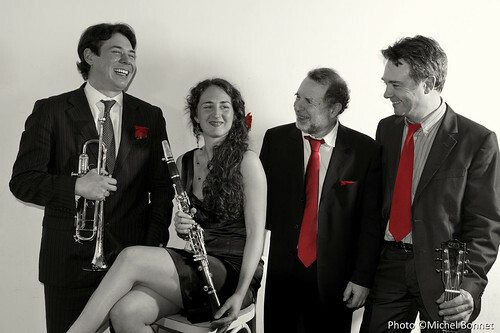 Also in december recorded a new CD by Philology, with a new band, the Italian Jazz Ensemble. 2005 On February he participated at “Dubai International Jazz Festival” with his quartet (D.Scannapieco-G.Bassi-E.Lanzo). In march a tour dedicated to Gorni Kramer e Natalino Otto with Franco Cerri. On April he partecipated at Abu Dhabi International Jazz Festival. On September he performed at Ischia Jazz Festival (by Umbria Jazz). On October a very important and long tour of 20 days in Australia performing at Manly International Jazz Festival close to Sydney, at Kyneton Jazz festival and at the Italian Jazz festival in Melbourne. After Australia, going back home, he performed by the Country Club in Hong Kong. In December recorded the new CD “Import Export” by Philology (W607) in quartet (M. Carrabba, I. De Marinis, E. Lanzo). 2006 On January performer by the Camerata Musicale Sulmonese, on February performed for “Sinatra Days” by the Verona Philarmonic Theatre. On March he performed at Orvieto Jazz and again at the Dubai International Jazz Festival from 6 to 10 March. On April performed at Terni Jazz In Spring and from 6 to 11 May at Europafest in Bucharest sponsored by the Italian Institute of Culture. On September performer for “Barattelli Concerti” at l’Aquila in quartet with Bepi D’Amato. On October 2006 performed in Japan at the Yokohama Jazz Promenade and Tokyo by the Italian Institute Of Culture’s Auditorium “Umberto Agnelli”. On November he toured Cuba partecipating at the “IX settimana della Cultura” invited by the Italian Embassy of Havana. On december partecipated at the International Movie Festival in Marrakech Marocco sponsored by the Rabat Italian Institute of Culture and performing also at Teatro Italia in Casablanca for the Dante Alighieri Association and the Italian Consulate in Casabalanca. Classica” in a special evening concert dedicated to Mario Pogliotti and presented by the very famous Tv conductor Piero Angela. Than performed at Macerata Jazz Festival and Onyx Jazz Festival in Matera. On November 26th to the 3rd of december he came back to Cuba for the “X settimana della Cultura Italiana all’ Avana” Sponsored by the Puglia Region. In November also two new cds : Two In One (Piano Elegy), just piano and voice with on pianos, Franco D’Andrea, Dado Moroni, Renato Sellani, Nico Morelli, Antonello Vannucchi, Eddy Olivieri, Giorgio Cuscito – Philology W 361, and “A Crooner In The Land Of Dixie – Philology W 362” with his new traditional Jazz band : The Larry Franco’s Jazz Society. Auditorium in Torino with the Rai Symphonic Orchestra, sharing the stage with Ray Gelato. In November toured for the tird time CUBA performing at National Theatre “Belle Artes” in Havana. In December performed at BLUE NOTE Milan with his trio. 2009 On January performed at Take Five Jazz Club in Tirana (Albania), the 5th of May performed at Rottweil Jazz Fest for a benefit concert for support l’Aquila’s Heartquake. On the 19th of June performed in Sofia (Bulgaria) for the Italian week of Culture “Qui Italia” invited by the Italian Institute of Culture. In July performed for the “Mediterranean Olympic Games “Pescara 2009 in Chieti Mediterranean Village, than on the 9th of July performed for the G8 in a concert dedicated with his new “Little Big Band. He performed at Sanremo Jazz festival on the 17th of August and at Sorrento Jazz festival on the 2nd of September. In September he performed at the 6th edition of “Pugljazz” Jazz Festival in Trani (Bari) with his renewed project “Import Export 2” with Michael Rosen, John Arnold and Ilario De Marinis. In October he performed for the “Camerata Musicale Barese” by the Sheraton Hotel in Bari in a Frank Sinatra’s tribute with his new Little Bid Band. In November he will perform for the XII Week Of Italian Culture in Cuba and to the “Jazz En Nord” Festival in France with a new quintet (Renato D’Aiello, Andrea Marcelli, Guido Di Leone e Ilario De Marinis). Than some concerts in Belgium (Charleroi – Liegi). In December will perform in London with Renato D’Aiello.